Rollerball was poised to be one of the big summer blockbusters of 2001. The fact that it was unceremoniously dumped into theatres in the box office wasteland of February in 2002 should tell you all you need to know about what a complete flameout it is. Norman Jewison's original Rollerball from 1975 has its detractors (myself not included), but it at least felt original and fresh and was packed with good action moments and performances and directed and edited with a fluid visual style. John McTiernan's Rollerball is hackwork. This version takes place in 'Central Asia' (as opposed to a futuristic society in the original) where a hot, underground sport, Rollerball, is immensely popular and is run by an unscrupulous cable television producer, played by Jean Reno. 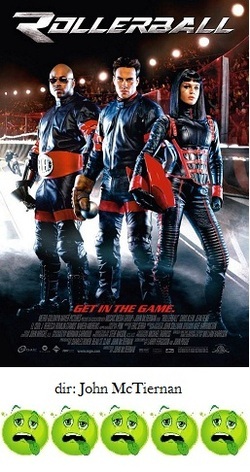 Our Rollerball 'heroes' are portrayed by master thespians Chris Klein, LL Cool J and Rebecca Romijn-Stamos. Since the sport of Rollerball is really what the movie is about, one would think that extra care would have been taken to actually explain what the game is and how it's played. No dice. Rollerball appears to entail a bunch of indistinguishably clad people on motorcycles and rollerblades who zip around a confused enclosed arena flinging little silver balls around at each other. Also, the arena seems to be designed in such a way to ensure mass injuries for every single player. There don't seem to be rules or strategies or anything else to allow an audience to understand or get involved with the game. The game itself is an afterthought. The screenplay feels that its commentaries regarding violence on television are profound. Reno is so evil that he...gasp...stages fights and injuries in the arena in order to get higher ratings. Yeah, I know, stop the presses, right? The performances by the cast are mediocre across the board; in fact, Klein's promising career took a massive hit after Rollerball's release, turning him into a trivia question. But the full blame for the movie's failure falls squarely on the shoulders of director John McTiernan, who seems to have developed a career out of having studios wrest creative control out of his hands for massive post-production damage control (much the same thing happened with McTiernan's The 13th Warrior). It's almost as if he set out to choose the worst ways to stage an action sequence on purpose; it's the only explanation for such a decision to film a climactic chase scene in night vision so that it's impossible to tell what's going on. There are many, many more examples. You could randomly pause a DVD of Rollerball at any point and see a botched, erratic moment. After Rollerball flopped, as well as his dire John Travolta thriller Basic a year later, McTiernan has yet to make another movie. Quite a fall for the man who created Predator and Die Hard.